– Create H.264 video: Create incredible-looking video for any use, from 3G for mobile devices to HD. – Create surround audio: Create a rich multimedia experience by adding multichannel audio to your movie. – Floating controls: Easily access functions like pause, play, fast-forward, and rewind while watching full-screen movies. – Background exporting:Export your movie in the background and continue with your next playback or editing task. – Improved movie authoring: The all-new Movie Properties facilitates simple and efficient movie authoring. 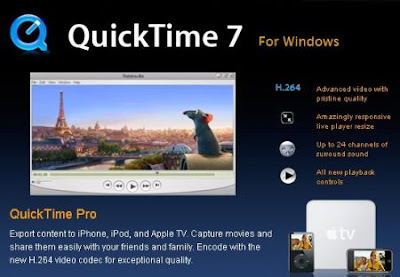 – Automate with VB Script: Automate your QuickTime workflow with native VB Script support in QuickTime 7. Developers can also use VB Script to access the new QuickTime Active X control for creating custom multimedia applications.